Sister Marion Agnes Daniel, MSBT founded Nazareth Housing. A Catholic woman religious in the congregation of the Missionary Servants of the Most Blessed Trinity, Sister Marion Agnes began her work in New York City in 1979 with the Lower East Side Area Catholic Conference (LESAC). Her work centered upon outreach among, advocacy for and empowerment of the thousands of people and families impacted by the blight of the Lower East Side. The most pressing need Sister Marion Agnes sought to address was the desperate situation of inadequate and unsafe housing. Working with others from LESAC she was involved in many aspects of community renewal for the neighborhoods of the Lower East Side including homesteading of buildings, housing for low income families, furniture and household items for those in need, Tompkins Square Park renewal, havens, and the Interfaith Housing Coalition. 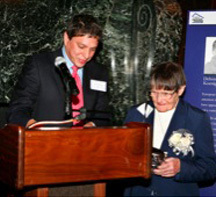 She helped rehabilitate 721 East 6th Street and the most recent brick and mortar project of Nazareth Housing which was named in her honor: Marion Agnes House at 206 East 4th Street. Sister Marion Agnes maintained a low profile in her work even as her compassion for people helped shape the quality of life in the Lower East Side. These critical grassroots efforts organized by Sister Marion Agnes formed the basis for Nazareth Housing in 1983. Known by many long time residents and community activists of the Lower East Side, Sister Marion Agnes always extended herself in service to anyone in need who sought her help. Sister Marion Agnes was a well loved and admired as a religious sister, community advocate and doer of good for those most in need. Sr. Marion Agnes never turned away someone in need. She set a standard for all of us to look for the best in the other and to find joy in the work we do, even on the most difficult days. She was feisty, determined and was well known for her Yankee sensibility, especially when confronted by bureaucracy and indecision. Each year she loved to retreat to her family’s cabin in Cape Cod, where she was refreshed by her connection with her family’s heritage. Sr. Marion Agnes died in the care of her sisters on October 27th, 2014. Her legacy lives on each day with the activities of Nazareth Housing. I have never met her, but I have heard about her vision, her compassion, and her courageous action on behalf of families struggling with poverty and homelessness in New York City. Sr. Marion Agnes has truly been a woman who has made a difference in the lives of so many of the most vulnerable among us. 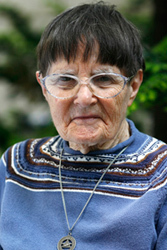 Sister Irene Ellis, O.P.